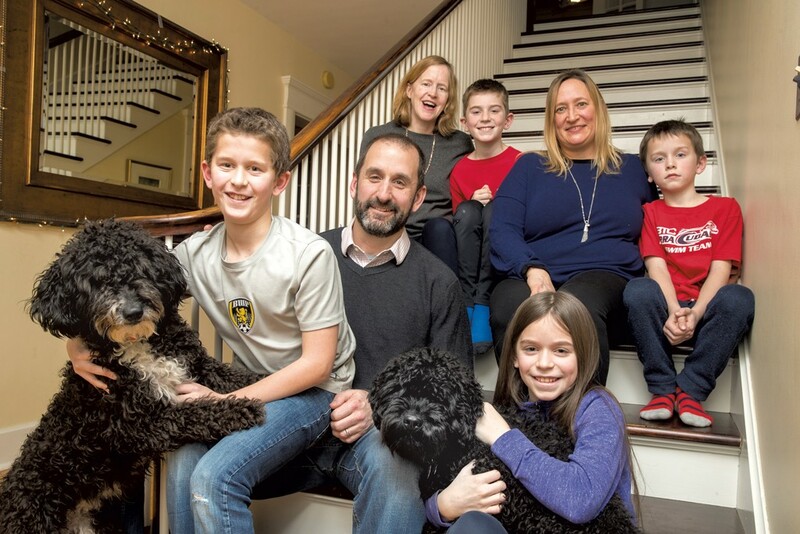 A Model of Care: A Pair of Doctors on Maintaining Schedules, Fostering a Child and "Third Parent" Support | Balancing Act | Kids VT - small people, big ideas! It's almost 6:30 on a weekday evening as Janet Kirwan pulls into the driveway and makes her way along the snowy footpath to her stately red brick house in the Hill Section of Burlington. She enters the foyer and joins her husband, Paul Crainich, who has already lit a fire in the hearth of their comfortable and elegant living room. He has just returned from taking the kids skiing during his day off from work and their day off from school. The aroma of spaghetti and meatballs draws Kirwan into the kitchen, where she finds Susan Brean, the kids' nanny for the past dozen years, just finishing up dinner preparations. Kirwan and Crainich chat with Brean, briefing her on the next day's schedule. As full-time doctors who are often on call, the couple rely on Brean to act, essentially, as a third parent to their four children. From October 2016 until December 2017, the family also had a foster daughter living with them. By picking up the kids from school and driving them to afternoon activities, grocery shopping, preparing meals and taking care of the family's two dogs, Brean helps keep the big and busy household running smoothly. Janet: Our schedules are different every day. So, we can work for 24 hours at a time, or I can be on call for a week at a time, and Paul works 12-hour shifts. Susan pretty much always helps out from 2 to 6:30 p.m.
Susan: It depends on what day it is and what time the kids get out of school, or what needs to be done, like grocery shopping. Janet: The schedule has changed so many times over the years. Susan: At one point, I was here 50 hours a week! Janet: There is endless work to be done. Janet: I love the sports and the adolescent kids and their homework and their relationships. And Susan spent so many hours reading to them — which is probably why they do so well in school. And playing board games with them, and arts and crafts, and sitting on the floor with them. Susan: [When] they were younger ... we didn't really go anywhere. If you didn't keep them busy, that's when trouble happened! Janet: They treat Susan like they treat us — no-holds-barred. It's like they have three parents. Susan: Yeah, I would say three parents. I don't have kids of my own, and I think of them as my kids! I always say my kids. Janet: And so you should! And when you see them do well at school, do you think you've contributed a ton to that? Because I think you have! Janet: While our family is more important than anything else, Hugo's soccer is not more important than my patient's heart attack or Paul's patient's stroke, so there is that balance. Janet: So the less important kids' stuff would definitely come after the patient stuff. Paul: But there's carpooling situations we've tried to get into as well. Janet: The carpool is always an issue because when I am on call, if I get a call, I have to go. So it's one thing ditching my own kid, like, OK, you aren't going to soccer today, but I can't ditch four other kids. There were a lot of things that I felt I couldn't fully participate in because I was on the phone or about to get a call. Janet: I had been down at the school ... Just seeing how some of the kids are struggling so much ... and how little we had to do to keep our kids happy and healthy and engaged in school. So I thought if there was a kid who was in trouble, that maybe we could help out temporarily. Paul: We thought, since we were out of the preschool stage, maybe helping a child in the same age bracket as our kids would be a good idea, and it turned out that she was a year older [than Hugo]. Janet: I had read there was a need for these kids who were slightly older. You just never know how long they will stay. It could be days; it could be many months. With our foster daughter, we found a perfect fit. She was a great girl. Janet: I felt we did something of value. Having been so hyper-focused on just ourselves and our kids and getting through the day and tennis lessons and swim practice, sometimes it just felt like it was too much. Paul: It was kind of shortsighted. We weren't seeing this whole other side and [our foster daughter] helped open things up for us. And I think our kids got this too, on their own sort of level. Janet: Yes, on their own level. They are a resilient bunch, and I don't think they overthink things. They each developed their own individual relationships with her.